Last month’s article considered the inverse relationship between the amount of energy an animal expends when displaying a perceived problem behavior and the animal’s level of confidence: the less confidence in their ability to cope in a particular physical and mental environment, the more energy these animals will put into their coping strategies. Consequently, more naturally submissive animals who find themselves in protective positions beyond their capacity may expend more energy barking, snarling, and posturing than more fit animals in that same environment. At first glance it may seem like it would be more difficult to convince these dogs to give up those behaviors. But in my experience, this often isn’t the case. Because the behaviors are costing these dogs so much, they have more to gain from giving up the behaviors than dogs who can gain stability using less energy under those same circumstances. For as reasonable as this may seem, client challenges may arise when more fearful dogs with fear-based aggression or other problem behaviors live in the same household with a more confident dog or dogs. Often owners perceive the aggressive dog as the "problem dog" and the other dog(s) in the household as "normal." However, comprehensive histories on all the dogs in the household often reveal that this isn’t necessarily the case. The other dogs may be every bit as protective of the owners as the problem dog. But if these animals possess more confidence, they may behave more like benevolent monarchs. They signal their claim on people in the household and their willingness to protect them in low-energy ways those folks consider acceptable, normal, and even loving in some cases. Even if they do have problems — e.g., ignoring the come command in favor of chasing squirrels — clients may view these as minor compared to the other dog’s aggression. Like dogs, clients also want to get the job done using the least amount of energy. If they perceive "the job" as eliminating Salty’s fear-based aggressive displays, they want to focus all their energy on her. As far as their other dog, Pepper, goes, they see no need to change the way they interact with him because he’s not aggressive. And if Pepper was the only dog in the household that would be true. It doesn’t matter what meaning or emotions people assign to their dogs’ behaviors as long as this doesn’t contribute to problem behaviors or stress-related medical ones. But this dynamic can change in multi-dog households because it’s easier for a dog to learn from another dog than a person. Furthermore, research indicates that dogs know when another dog gets something they don’t. For example, suppose benevolent canine monarch Pepper engages in low-energy displays — bumping, learning, licking, pawing, etc. — to gain his people’s attention or otherwise control their behavior. However, they ignore Salty when she attempts to elicit a similar response because of the negative effect their reactivity has on her behavior. The conflict created by her owners’ continued reinforcement of Pepper’s protector status while demoting her may cause Salty to put even more energy into her problematic responses. Now supposed that Salty’s and Pepper’s folks bite the bullet and make the same bond and behavioral changes to both dogs. In this situation, Salty may accept these much more readily than Pepper because she has more to gain by doing so. However because it costs Pepper less to retain his claim on those valuable bi-peds, he resists changing the human-canine status quo. Suddenly, the problem dog becomes the easy one and the easy one becomes the problem one. As you might expect, clients accept this potential reality much better if they’ve been educated regarding this possibility and how to address it before it occurs. Although clinicians feeling a little short on energy themselves may decide to take an "I’ll deal with it if and when it happens" approach and skip this this step, experience has taught me that approach can backfire. Another multi-dog scenario appears to be occurring more frequently in our society: different dogs belonging to different owners living in the same household. These come in multiple forms, any of which may create human and canine challenges when one of the animals develops behavioral problems. Two groups consist of people who enjoy each other’s company who decide to live together who also have dogs. Students with dogs who rent a house with other dog-owning students belong to this group. So do couples in dedicated relationships who merge households, each of which includes a dog. In this situation, the people enjoy each other’s company and like dogs. Those in a third group are dog owners who share housing with other dog owners for purely economic reasons. In some areas, rental properties that accept animals may be scarce and expensive due to security deposits that include hefty canine surcharges. Unlike those folks in the first groups, most of these people would prefer to live alone with their dogs. But they simply can’t afford to do so. For clinicians doing behavioral work unaware of how the human-canine bond can affect the resolution of behavioral problems, these cases can be frustrating. 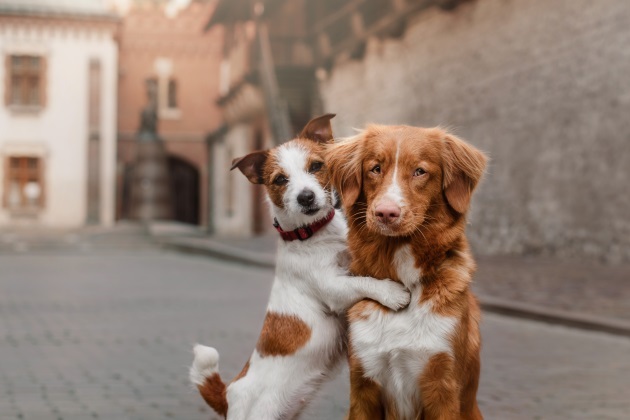 Because a significant number of dog owners tend to view their pets symbolically rather than ethologically, behavioral problems in one dog that require the cooperation of another dog-owner in the household may generate all kinds of complex human emotional responses. For example, if Mary considers John a good friend or potential life-partner and likes his dog, it’s easier for her to summon the wherewithal if John asks her to alter her interactions with her own dog to help him and his dog. But if Mary only shares a home with John and his dog because she can’t afford to live alone with her own dog, summoning that same degree of commitment to help John and his dog will be more difficult. The latter situation can be especially difficult if Mary is one of those people who have little interest in other dogs despite — or maybe because of — their great attachment to their own animal. In both cases, if the behavior of John’s "problem dog" improves and Mary’s good dog resists, this can reveal cracks in the human-human relationship that will affect both dogs’ behavior. If the human-human relationship falls apart as a result of this, clinicians who recommended the behavioral/bond changes without discussing this possible second-dog response may tell themselves this would have happened anyhow. On the other hand, if John and Mary patch things up by blaming the practitioner who recommended the changes and decide not to do anything to help either dog, that doesn’t help the animals. So while it may seem more efficient to just focus on the dog with the problem behavior or even just the behavior itself, ignoring any other dogs in the household as well as the bond may come back to bite you — or someone else.